Unfinished at the time of his death, the details of how Wolfgang Amadeus Mozart’s Requiem Mass in D minor came to be completed continue to invite controversy. His widow, Constanze, engaged Franz Xaver Süssmayr to ensure that the requiem was finished after another composer, Joseph von Eybler, had decided that the task was beyond him. What we will probably not discover is just how many of Mozart’s sketches for those parts of the work that do not bear his autograph guided Süssmayr, although the latter claimed that the Sanctus, Benedictus and Agnus Dei were his invention entirely. Mozart never knew who had commissioned his final composition. His anonymous client was Count Franz von Walsegg, an aristocrat known to purchase the music of others and pass it off as his own. The reason for him requesting a new work on this occasion, however was very different: to mark the anniversary of the early death of his wife, Anna. She had died in February 1791; Mozart passed away the following December. 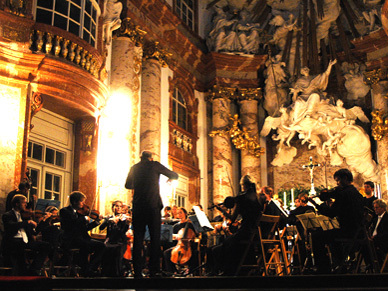 Now Vienna’s St. Charles Church provides the magnificent venue for a series of performances of Mozart’s Requiem by Cantus XVII, the choir and soloists of the Salzburger Konzertgesellschaft, accompanied by Orchestra 1756. 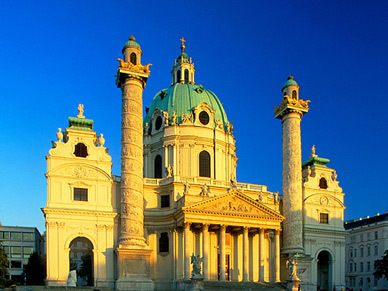 Built between 1716 and 1737, the Karlskirche is an outstanding example of baroque architecture that still dominates Vienna’s skyline. Renowned for their authentic interpretation of the composer’s repertoire, Orchestra 1756 only use the instruments that would have been available to Mozart in his day. Prepare to be whisked back in time and experience the Requiem Mass just as audiences in the late eighteenth century would have heard it. In order to book a ticket, please go to Schedule and select your preferred date and time.